Boise, Idaho – UCLEAR Digital announces today the release of a new line of premium helmet audio/communication products. Named for the unparalleled sound quality, the new AMP line allows motorcyclists to enjoy music, hands-free smartphone operation, and intercom communication while riding. Simple, tool-free installation in nearly any helmet style instantly takes your adventure to the next level. AMP Series systems are also accompanied by an industry-first free mobile app that enables the user to wirelessly run software updates, easily set up the unit, customize preferences, and watch simple tutorials. 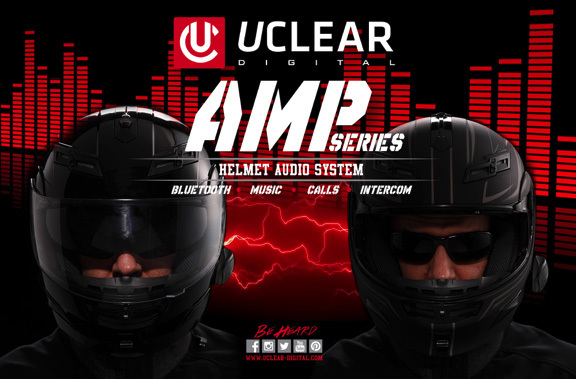 According to the lead project manager, “The AMP Series is an upgrade from our popular HBC line of helmet audio systems. Building on the success of our exclusive concealed microphone and patented sound technology, our engineers have developed a reliable, worry-free helmet audio system with intercom and hands-free capability.” Quick setup and easy installation make this the perfect upgrade to any helmet.